Color Magnet, by The One Pixel, is a classic color-matching puzzle game with a twist. A grid of colors blocks advances down the screen as you drop in strategically placed new blocks to make color matches. The blocks are magnetically attracted to other blocks of the same color. When placed on the grid, the blocks between the newly placed piece and the closest piece horizontally or vertically of the same color change to match the color of the block you placed. Match five or more blocks to clear them and the ones below them on the board. Gameplay is complicated by locked and cross blocks. A locked block is unlocked by matching colors nearby or clearing a cluster of blocks next to it. Once unlocked, a block becomes a random color. Cross blocks can only be destroyed by clearing blocks above them in the stack. It's not nearly as complex as it sounds, though it requires careful planning and strategy. Color Magnet looks and sounds great, pairing a palette of pastel colors with a playful soundtrack. There are also light and dark themes for comfortable late-night binge playing in bed. Replay-value is enhanced by three game modes. Classic mode challenges players to beat their high score. Universal mode pits you against the rest of the Color Magnet-playing world with the same sequence of puzzles presented to everyone. Puzzle mode has 30 unique puzzles that challenge you to clear the entire board. The magnet mechanic and depth added by the trio of gameplay modes takes what might have been a 'me-to' matching puzzle game and gives it a unique spin that's fun and addicting in the same way Threes is. 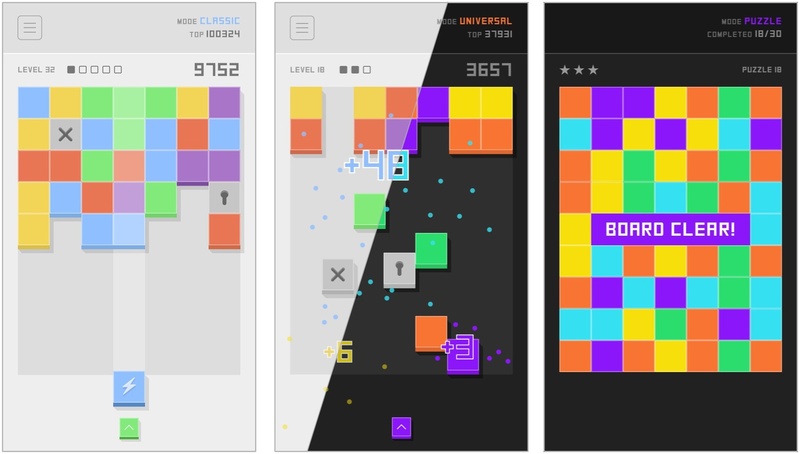 If games like Threes are your thing, Color Magnet won’t disappoint. Color Magnet is available on the App Store.